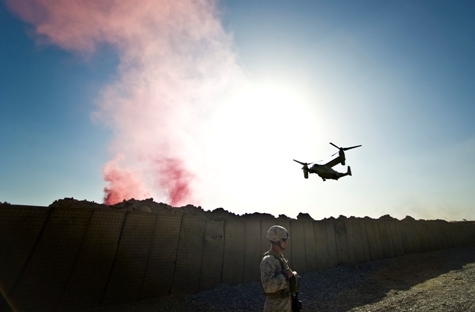 Are Marines really deploying to Kandahar? You are at:Home»Afghanistan»Are Marines really deploying to Kandahar? Several media reports this morning say that Defense Secretary Robert Gates already has approved sending 1,400 additional Marine forces to Afghanistan within the next few weeks. Col. David Lapan, a Pentagon spokesman, tells the Associated Press this morning that the additional forces could deploy within weeks. He did not identify the unit that will be deploying. The Wall Street Journal takes it a step farther. The newspaper reports that the forces will deploy “in the south, around Kandahar,” a marked change to the current setup, in which nearly all Marines in Afghanistan are deployed in Regional Command Southwest under Maj. Gen. Richard Mills. Kandahar province falls under the control of RC-South and the U.S. Army. One of two things are going on here. The first is that Gates has approved a “mini-surge” of Marine forces to Helmand province — possibly Sangin district — and it has been misunderstood to mean Marines are deploying to Kandahar. The second is that Marines will now be involved in Afghanistan’s two most kinetic fighting environments. I’ve already reached out to Marine sources at U.S. Central Command, the Pentagon and in Afghanistan on this rumor. It seems likely additional details will come to light following a 2 p.m. press conference at the Pentagon today with Gates and Adm. Mike Mullen, Joint Chiefs chairman. They’re expected to take questions and outline a series of budget cuts to the Defense Department. UPDATE: In an e-mail, Lapan tells Battle Rattle that the additional Marine forces will fall under RC-Southwest. That all but assures they will conduct operations in Helmand province, not Kandahar province.